Obviously, we are big on boosting the oral health of our patients at our North Carolina dentist’s office. But we are also concerned about appearances. That’s why the Sunrise Dental team has invested heavily in the sort of tools and training that can take your smile where it needs to go this Spring (and beyond). Keep reading to hear about the possibilities and then be sure to schedule your cosmetic dentistry consultation with Dr. Vice! Yellow Teeth? Try Teeth Whitening! You don’t have to go on feeling blue about your yellow teeth! Our professional whitening procedures can quickly brighten your world. Our safe and reliable methods involve using an ultra-strong bleaching agent that is applied in a custom mouthpiece. We currently offer Sinsational Smile®, a comfortable whitening system that can offer you a brighter, more beautiful smile in just 20 minutes! This great option is also only $99 right now! In addition, we offer Opalescence take-home whitening. The Invisalign Alternative Orthodontic Program Is Easy! Too old for braces? No problem! You can fix crooked, crowded, or gapped teeth at any age without using metal brackets and wires. The Invisalign clear aligner system that we use is far more comfortable than standard braces. And they are actually removable, which makes eating more enjoyable, and cleaning a snap. No dietary restrictions or weird tools will be required. And treatment can be completed in only about one year’s time, rather than 2-3 long years! Widespread Dental Damage? It Might Be Time For Dental Veneers! If your smile is worse for wear, you’ll be happy to know that our dental veneers are a great a catch-all solution. These thin coverings are made of porcelain and are used to cover up years of various dental damage. Veneers get attached directly to the front of your teeth after a layer of enamel is removed. This removal is a minimally invasive step and simply ensures that they will be a good fit. When dental veneers are cemented to the front surfaces of your teeth, the porcelain material becomes extremely sturdy and resistant to damage. Do You Have A Gummy Smile? Reshaping & Recontouring Can Even Things Out! Want to correct an overly gummy smile? We can get the job done with our laser gum reshaping therapy. This forward-looking laser system allows us to reshape your gum line involving less healing time, less discomfort, and a lot more precision than when it had to be done by hand. We can also recontour your teeth using the same laser technology. Not Ready To Go Big? Dental Bonding Is Perfect For Minor Flaws! 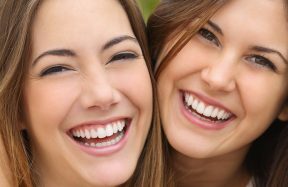 If your smile has a few minor imperfections that don’t necessitate a big makeover, dental bonding might be just the treatment for you. It is a cost-effective, fast, and easy solution as far as cosmetic dentistry goes. All we do is apply a layer of tooth-colored adhesive materials and smooth it over until you have a blemish-free smile. Make Your Smile Makeover Happen! You know you deserve a healthier, better-looking smile. So, what are you waiting for? To hear more about the above treatments and our other cosmetic dentistry options, contact us online today!